I showed you the changes in our dining room yesterday. Today I thought I'd show you what this craigslist buffet looked like before. Let me start by saying that I have HORRIBLE luck on craigslist. I never find a thing. I have a couple friends that are kind enough to look for things for me when I'm in need of something specific. They came up with some really great pieces, but they were either the wrong size, too far away, or already sold. I was starting to get discouraged, and then I found this. I got a response right away and went to pick it up immediately. This is a antique, a real antique. It was the homeowners fathers fathers. Some people would say it's a shame to paint over wood. But, it was scratched and I new I didn't want something dark. It had a shiny varnish on it. I am not the most patient person in the world, like, at all. I really didn't want to have to spend hours prepping this for paint. That is why I LOVE Annie Sloan Chalk Paint. NO SANDING OR PRIMING NECESSARY! I used Old White, waxed it with their clear wax and added a bit of the dark wax in some places. The hardware wasn't bad but I wanted black. I just like the contrast. I found some old black hardware at a salvage yard for under $20 for all of it. It is the PERFECT addition to this wall! It fills up the awkward space under the shelving perfectly. And, not to mention all that extra storage! I haven't even filled it up yet. I created a bar like area out of the top. I filled a bowl with limes and on the other end I placed a big pillar candle in a clear vase. 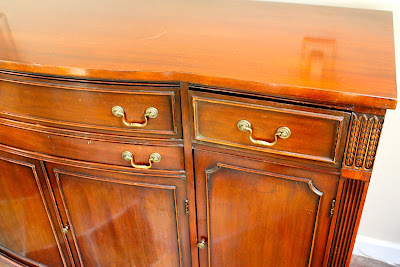 I hope I have inspired you to bring new life to an old piece of furniture with a little paint! I had a few questions on our dining room table. I am also listing "you are my sunshine" pillows in my etsy shop in a few! Looks fantastic! You really didn't do any sanding first? I think I need to buy some Annie Sloan paint today!!! Great job! Adore the cream and the shelving above is lovely! Fabulous! Did you seal the paint with anything? I'm wondering if putting anything on top of it will start to scratch the paint off? Fantastic!!! absolutely gorgeous! Well done!! It looks incredible! Love that ASCP finish - so pretty! Thanks for sharing. I love it!! I like it better, after. Guess what I'm doing today? Painting! I'm with you on poor luck on Craigslist. Of course I live in the poorest county in California and everything is really used up. Or if listed, too expensive. Great redo of the buffet. I'm with you . that was on odd color of wood and the black handles are perfect. Beautiful! I love the dining room, chairs and buffet. And the sunlight coming through the windows must be divine. Glad I found your blog (through Country Farmhouse). I plan to return again and again. Melaine, this is just gorgeous. Have been debating whether or not to paint some "perfectly good" Ethan Allen pieces I have had for a while and this may just tip me over the edge. I've been following you for a while - in fact yours is one of the first blogs I ever followed (found you on RateMySpace) - and have bought some lovely things from you on etsy. Your truly have a magic touch. Wow, what a great job. Looks perfect in it's setting. Don't you just love to repurpose? I do too. Just great!!! I really like your salvaged black hinges/drawer pulls. What did you do to adjust to the size discrepancy in the drawer pulls? It looks like the old piece had handles needing two holes and the finished piece looks like it is just one piece? Thank you thank you thank you for posting this!!!! 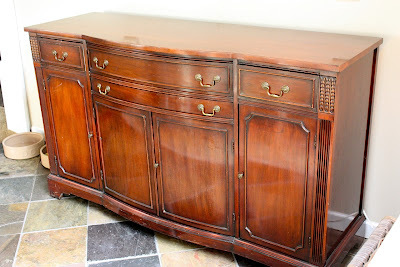 I just inherited a very similar buffet that was my great great grandma's, i posted about it on my blog a few weeks ago (http://ahappymamma.blogspot.com/2012/01/13-15-366-project-365.html). i have been sitting on this project for weeks just stumped on what to do with it because i didn't want to have to sand it, prime it, etc. i have a matching dinning table and chairs too, do you think you can use the annie's paint on that as well? will it scratch off? where do you find this fabulous paint? 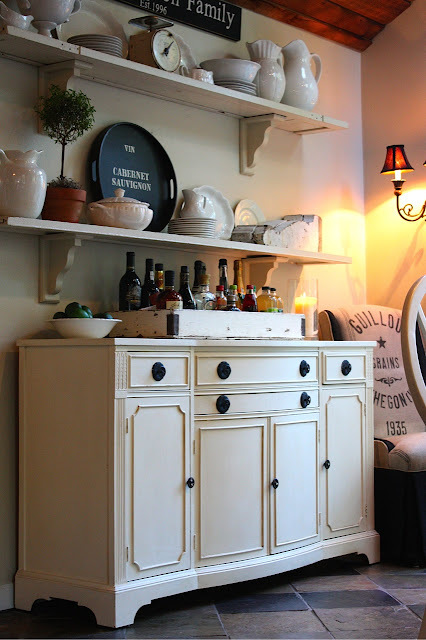 Where in Washington state did you find a retailer for Annie Sloan chalk paint? Did you have someone nearby and drove to pick it up, or did you call and order it from a retailer? I'm in Idaho and of course we have nothing nearby. I love the look and especially love that it is low VOC. Thanks! What an incredible transformation!!! It looks fabulous sporting it's new white color :o)Love the hardware too! What a beauty! 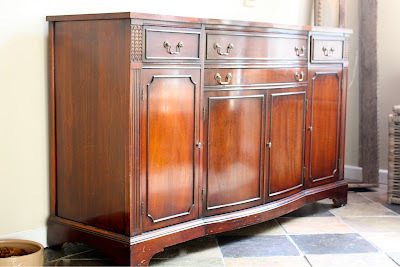 I've been scouring craigslist for months trying to find a buffet for my dining room. This will keep me up tonight! LOL! AMAZING! Love how the black hardware picks up the color in the sign at the top and the tray in the middle. The entire wall is gorgeous. You did a great job. Absolutely fantastic restyle! Lookin' good! Looks beautiful! Isn't ASCP the most fun paint to play with since...well, finger paint?! Annie Sloan is doing a big tour in the States this March/April, and I've signed up for one of her workshops in Atlanta. I'm SO excited, I just might faint ~ it feels like scoring tickets to a Springsteen concert! 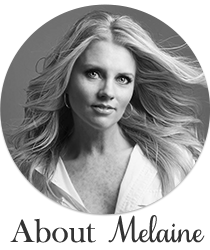 Thanks, Melaine, for being such an inspiration to your readers. Here's to "Possibility!" xoxo Terrie M.
What a beautiful piece. I love the changes you made in the dining room. This paint sounds like the perfect paint for me. I have 2 pieces I need to re-do. Might be a Spring break project since I now know where to get Annie Sloan paint in the Houston area. I like the transformation of the buffet. We shop craigslist all the time. Did you really just use the chalk paint with NO sanding? Any paint that advertises "no prep required" usually says somewhere in fine print to do a "light sanding"....and then I give up! I have the same look in my dining room but painted my table legs to match the buffet - it really pulls it together nicely. Meanwhile, love your blog and will be following you regularly, also your Etsy site. I seriously think it looks so much nicer painted! There are few wood peices I actually like not painted. Lovely job! 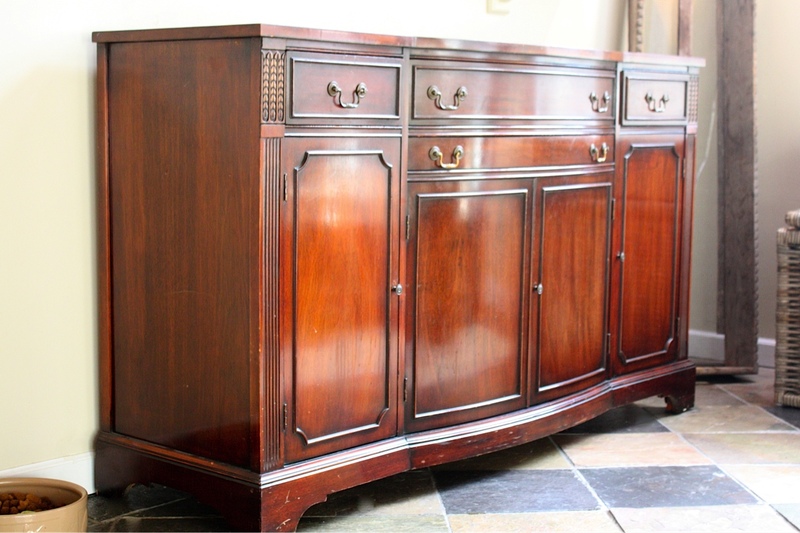 That buffet makes a perfect addition to your dining room! You did a great job! What a GREAT find! It turned out beautifully! Looks great, yes the Annie Sloan paint is a miracle worker! I sometimes have to come visit just to listen to your music - it makes me so happy! Truly, thank you so much for the inspiring stories, beautiful photos and music. Your buffet looks wonderful. 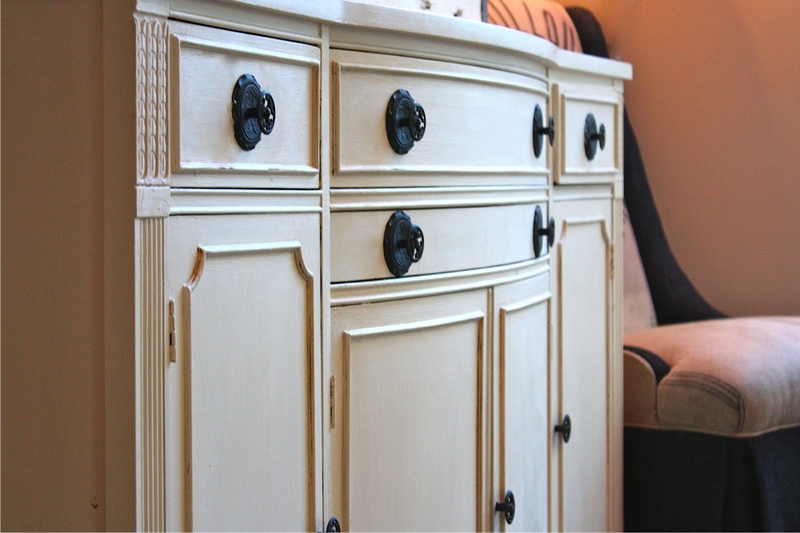 We here in Northern are just getting to know Annie Sloan Paint, a small boutique Serra Bella, has started carrying it. Do you use a brush or do you spray paint ? Just wondering. We have a buffet that looks very similar, that we got for free at a yard sale.... yeh boo hoo for us, lol. But we need to paint it and I love the look of your buffet. Thanks. You did a beautiful job. I bought some of the same color Annie Sloan Paint, I have not used it yet. 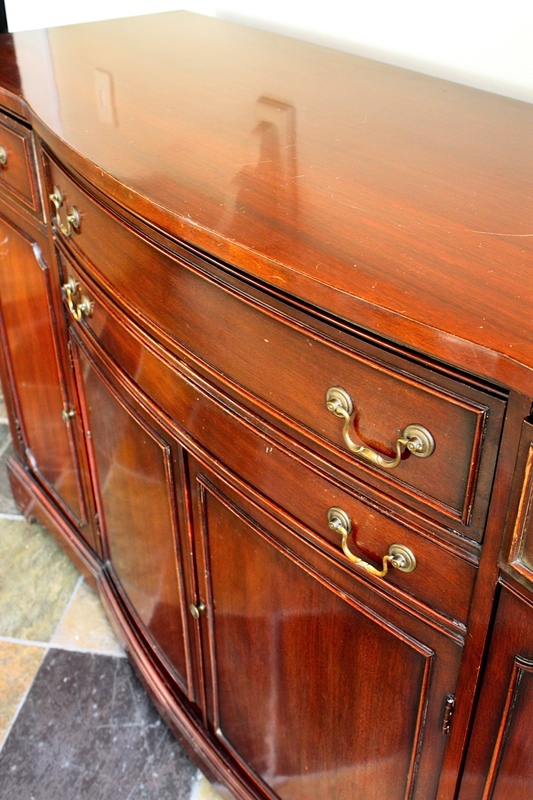 Did you do anything at all to the dresser before you started painting. Way to go! Thank you for sharing! Yay! 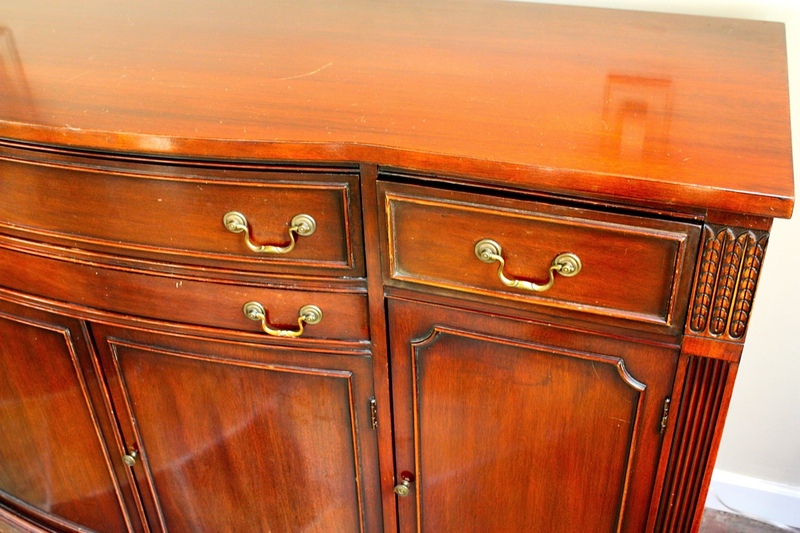 I just bought a fabulous antique 1940's buffet with the curved front and drawers/cabinets on Craigslist after seeing your post to help solve a serious space issue I have in my kitchen (hoping to spill into this for extra cabinet and drawer room, since some designer thinks two drawers is enough space in a full-sized kitchen). I am picking it up on Saturday and can't wait to start the process. Thanks for the inspiration!! Wow- that's such a fabulous transformation! I've seen others mention that paint but didn't realize you didn't need to sand off the varnish first. Great tip!